The 13.3" MacBook Pro Notebook Computer with Retina Display from Apple is a powerful notebook computer with an innovative, ultrathin, ultraportable aluminum unibody design. It is loaded with advanced power management features and an integrated lithium polymer battery, which work together to provide up to 9 hours of wireless web browsing. The widescreen, LED-backlit IPS screen has a glossy finish and a native resolution of 2560 x 1600. With 227 pixels per inch, this MacBook Pro has a pixel count of over 5 million. You'll be able to output to 2 external displays at up to 2560 x 1600 via Thunderbolt 2 (Mini DisplayPort). Any Mini DisplayPort-compatible display will plug in without the need for an adapter. This MacBook Pro also adds an HDMI port so HDMI-compliant devices, particularly HDTVs, are now natively supported as well. Graphics are handled by integrated Intel Iris Graphics. The system is powered by a dual-core 4th generation Haswell 2.8 GHz Intel Core i5 processor. The 4th-gen Haswell processor uses low voltage for improved battery life without sacrificing performance. The MacBook Pro with Retina Display also has 8GB of onboard 1600 MHz DDR3L RAM, 512GB of PCIe-based flash storage and an SDXC media card slot. You'll be able to connect to the Internet with high-speed 802.11ac Wi-Fi. The MacBook Pro also supports a/b/g/n Wi-Fi networks as well. The MacBook Pro also features built-in Bluetooth 4.0, which allows you to connect wireless headphones, keyboard, mice and other compatible peripherals without a hassle. The MacBook Pro comes with free versions of Pages, Numbers, and Keynote. However, they do not come preinstalled so you'll have to manually download them from the Mac App Store. Pages allow you to make creative word documents. Numbers helps you make spreadsheets more visually insightful. Keynote allows you to create a powerful presentation, complete with animated charts, interactive tables with cinematic effects and transitions. The 64-bit Mac OS X features Time Machine backup, which automatically backs up system data to an external hard drive. It also features intuitive Cover Flow navigation, the powerful Spotlight search tool and Quick Look document preview. You'll be able to use Boot Camp to run Windows on your Mac, if needed. The 13.3" display of this MacBook Pro features over 5 million pixels. The pixel density is so high your eyes won't be able to discern individual pixels. Now with a 2560 x 1600 native resolution, you can see more of your high-resolution images onscreen with pixel-for-pixel accuracy. The Retina display also reduces glare while maintaining incredible color and quality. In fact, it has a 29 percent higher contrast ratio than a standard MacBook Pro display. IPS technology gives you a wide, 178-degree view of everything on the screen, so you'll see the difference at practically any angle. The 4th-gen Haswell Intel Core i5 processor with a state-of-the-art 22-nanometer single-die microarchitecture in this MacBook Pro provides fast dual-core performance. Intel Hyper-Threading technology allows two threads to run simultaneously on each core. The dual cores can run at a stock speed of 2.8 GHz. The processor can be overclocked up to 3.3 GHz, thanks to Intel Turbo Boost 2.0 technology. 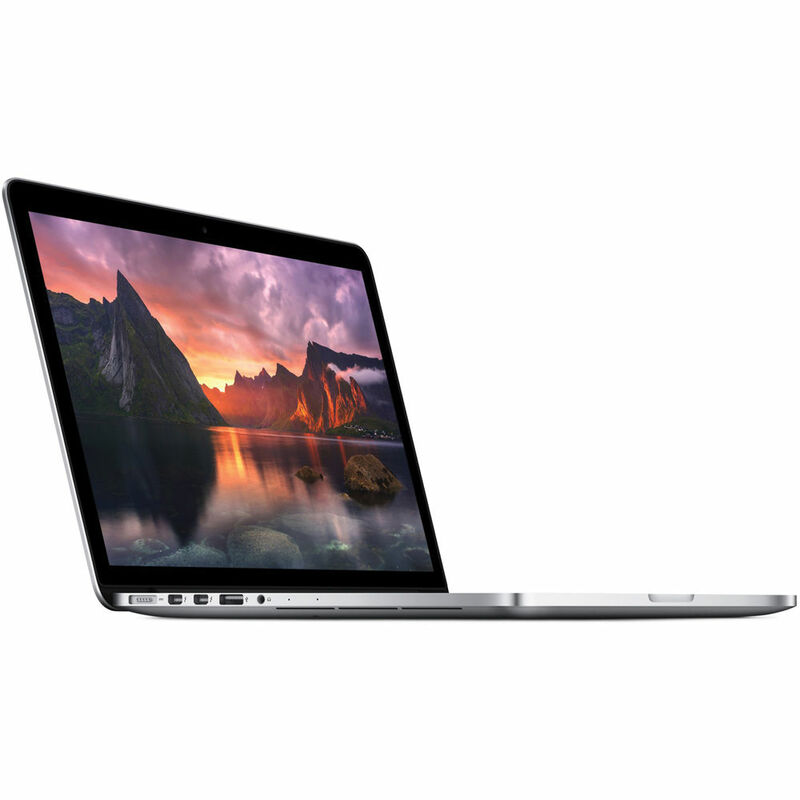 With a 3MB L3 cache and 8GB of onboard 1600 MHz DDR3L RAM memory, this MacBook Pro can run professional applications like Aperture and Final Cut Pro with ease. This MacBook Pro feels incredibly fluid and responsive. It's all thanks to its PCIe-based flash storage, which gives you up to 60 percent faster read and write performance than its predecessor. When you use apps like Final Cut Pro or Aperture, you can perform even the most demanding tasks right from your internal storage. And since this MacBook Pro comes with 512GB of flash storage, you can keep all your important files with you, including large video and photo libraries. Flash doesn't have any moving parts, which makes it reliable and quiet. And flash storage is extremely energy efficient, which means your MacBook Pro also has the ability to stay in standby mode for up to a month without having to be plugged in. The built-in lithium polymer battery provides up to 9 hours on a single charge (battery life may vary upon use) and gives you up to 1000 full charge and discharge cycles as well as up to 30 days of instant-on standby time. Which means you can put your MacBook Pro to sleep, and it'll come back on instantly - after a day, a week, or even a month. With Power Nap, your MacBook Pro can continue to receive email and calendar invitations while it's asleep. And when it's connected to a power source, it can download software updates and make backups with Time Machine. So the next time you open your notebook, your MacBook Pro is updated and ready to go. The new MacBook Pro features the next-gen Thunderbolt 2. It delivers twice the throughput, providing up to 20 Gbps of bandwidth to each external device. So you're more than ready for the next generation of high-performance peripherals and displays. You can connect massive amounts of storage and add a PCI expansion chassis. And since each Thunderbolt 2 port allows you to daisy-chain up to six peripherals, you can go all out by plugging in up to 12 external devices via Thunderbolt alone. With an emphasis on mobile, the MacBook Pro with Retina Display is equipped with 802.11ac Wi‑Fi and Bluetooth 4.0 wireless technology. With AirPlay and Apple TV, you can wirelessly play video, show off photos, and enjoy music from your MacBook Pro on your widescreen TV. And when your MacBook Pro connects to an 802.11ac Wi‑Fi base station, such as AirPort Extreme or AirPort Time Capsule, your wireless performance is up to three times faster. For something so thin and light, the built-in speakers have a surprisingly wide dynamic range, an optimal balance and a crisp, expressive quality. Dual built-in microphones are great for when you want to be heard. If you're making a FaceTime call, for example, the mics reduce background noise from behind the notebook. And when you use Dictation, they create an adaptive audio beam that intelligently adjusts to detect your voice instead of the noise around you. iCloud stores your content and lets you access your music, photos, calendars, contacts, documents and more from which ever device you're on. So you'll be able to access your photos, reminders, notes, music and videos from your iOS devices right on this MacBook Pro. It may be thin and light, but this MacBook Pro is also incredibly powerful. To achieve all that in a single design required relentless focus and a willingness to make bold decisions. Bulky legacy technologies like the spinning hard drive and optical disc drive were left behind in favor of higher-performance technologies - all-flash storage, for example. It's much faster and far more reliable than a traditional hard drive. And it takes up 90 percent less space. The Retina display is a breakthrough - any way you look at it. Apple pushed the limits of technology to create a pixel density so high, you can see everything you're doing with perfect clarity and make edits with pinpoint accuracy. Not only is it the highest-resolution display ever on a notebook, it has a more integrated design that achieves a level of fit and finish never before possible. This Retina display doesn't sit behind a layer of glass, it is the glass. Which means you get all the benefits of a state-of-the-art display - vibrant colors, high contrast, and wide viewing angles - with very little glare. So there's more to see, and even less to distract you from your work. This MacBook Pro is ultrathin and ultraportable, resembling more a MacBook Air than a MacBook Pro. It is 0.75" thin and weighs less than 4 pounds, so this MacBook Pro embodies the performance of a MacBook Pro, but has the body of a MacBook Air. This MacBook Pro supports 100-240V AC with 50/60Hz frequency. It can operate at a temperature from 50 to 95°F (10 to 35°C) and an altitude of 10,000 feet. It can be stored at a temperature from -13 to 113°F (-24 to 45°C) and an altitude of 15,000 feet. It can also stand a relative humidity range of 0 to 90% (noncondensing). At 5.1 million pixels, the Retina display is the perfect place to view and edit your high-resolution photos. Dot for dot, more of your image can fit on the screen - which makes editing photos far more precise. And with four times the number of pixels than a standard 13-inch MacBook Pro display, you can see fine details and textures like never before. In fact, the Retina display is so sharp, you can tell which photos are in focus just by looking at the thumbnails. With two ultrafast Thunderbolt ports, two USB 3.0 ports and an SDXC card slot, you can build a photo studio around this MacBook Pro. Or take it with you and import thousands of RAW images on location - up to five times faster than on a standard MacBook Pro. Once your photos are on your computer, editing in Aperture is faster and more responsive than on any other MacBook ever built. And high-speed flash storage lets you quickly browse large image libraries from internal storage. So you have instant access to any photo in your library. The processor, graphics, and memory inside the MacBook Pro are built around an all-flash architecture - giving you unprecedented mobile video editing capabilities. Super-responsive flash storage delivers up to nine streams of 1080p ProRes (HQ) content for multicam editing in Final Cut Pro X, while the state-of-the-art processor decodes multiple streams of video, and a powerful GPU renders millions of pixels onto the screen. With flash storage that offers up to four times the performance of a traditional hard drive, you can even edit four streams of uncompressed 8-bit 1080p HD video, right from your internal storage. Having four times the pixels of a traditional display changes how you edit video on a notebook. Especially in Final Cut Pro X. For the first time on a portable computer, you can view your video in pixel-accurate 1080p HD and see your editing workspace onscreen at the same time. And video is so sharp, so clear, and so lifelike, your shots may look even better than you remember. With 2560 by 1600 pixels, the resolution of the Retina display is so high, it rivals the printed page. Combined with reduced glare, higher contrast, and a 178-degree viewing angle, this Retina display is the ideal place to see your work. High-performance graphics and processors let you render images and apply filters with incredible speed. And thanks to flash storage and superfast 1600MHz memory, you can access and edit large-format files much faster than on a traditional notebook. The latest quad-core processors and 1600MHz memory provide an enormous amount of computational power. And the latest GPU technology and the high-resolution Retina display allow you to visualize your data like never before. From 3D molecular modeling and DNA imaging to architectural renderings and structural analysis, this MacBook Pro will have you working anywhere. Since the software on every Mac is created by the same company that makes the Mac, you get a fully integrated system in which everything works together perfectly. OS X works with the processor in your Mac to deliver the best possible performance. The Multi-Touch trackpad on every Mac notebook gives you more than enough space to pinch, swipe, and tap your way around most of the apps on your system. OS X gives you long battery life by dimming the screen in low-light conditions and even regulating processor activity between keystrokes. Tap, scroll, pinch, and swipe using Multi-Touch gestures, directly controlling what's on your screen in a more fluid, natural, and intuitive way. When you scroll down on your trackpad or Magic Mouse, your document scrolls down. When you scroll up, your web page scrolls up. When you swipe left, your photos move left. And there are many more gestures that make all you do on your Mac the best experience you can have on a computer. From the desktop you see when you start up your Mac to the applications you use every day, everything is designed to be simple and intuitive. It works seamlessly with iCloud to keep your music, photos, calendars, and more up to date across all your devices. The Finder gives you easy access to all the files on your system. It lets you find, organize and access practically everything on your Mac - including applications, files, folders, discs, and shared computers on your network. You can sort files by kind, application, date modified, date added, or size. But with so many files on your computer, finding a specific one can be a challenge. Not on a Mac. Features like Spotlight and Quick Look make locating the file you're looking for effortless - even if you don't know the filename. And with Quick Look, you don't need to open an application to verify that you've found the right file - view a full-screen preview by hitting the space bar. Want to share a file with someone nearby? Just drag and drop to send it to the person wirelessly with AirDrop. OS X offers system wide support for gorgeous, full-screen apps that use every inch of your Mac display. You can have multiple full-screen apps open at once - along with multiple apps in windows. And it's easy to switch between full-screen and desktop views. Mission Control gives you a bird's-eye view of all your windows and full-screen apps, and allows you to instantly navigate among them. Auto Save automatically saves your work while you work, without you having to do a thing. Versions creates a new version of a document each time you open it and every hour while you're working. It saves only the differences between successive versions, so the impact on your disk drive is minimal. Just open Versions to see the current document next to a cascade of previous versions. You can copy and paste between versions or revert to an earlier version. And when you share a document, you share only the most recent copy. iPhoto is an easy-to-use photo application that makes it fast and fun to organize and find your pictures, as well as make them look their absolute best. With features like Faces, Places, and Events, iPhoto helps you keep track of your photos by who's in them and when and where you took them - all in an immersive full-screen view. Quick and simple editing tools let you make so-so shots picture perfect with just a few clicks. Photo Stream in iCloud automatically pushes new photos to all your devices, so you're never without your latest shots. And if you feel like showing off what you've captured, iPhoto lets you share with beautiful photo books and letterpress cards or online via Facebook and Flickr. With iMovie, you can transform the videos you shoot into your very own indie flicks. If you know how to drag and drop, you can make a movie in iMovie. It comes with Apple-designed themes that look fun and professional. Just choose one and iMovie does the rest, adding animated titles and sophisticated transitions automatically. Customize your screen gem further with your own words and audio. Whether you're musically gifted or mostly curious, GarageBand is the application for you. Plug in your electric guitar or USB music keyboard and get ready to rock with virtual replicas of the most revered amps and stompboxes in the world, as well as over 100 software instruments. Just because you didn't grow up learning your A, B, and C sharp doesn't mean you can't. Basic Lessons teach you just that: the basics. Choose from 40 lessons that cover blues guitar, rock guitar, classical piano, pop piano, and more. Or get a private lesson from one of your musical heroes, like Sting or Death Cab for Cutie, with Artist Lessons. GarageBand even tells you how well you're playing in real time with a feature called "How Did I Play?". Now you can launch the iBooks app on your Mac and the books you've already downloaded on your iPad, iPhone or iPod touch will automatically appear in your library. And there are over 2 million more books in the iBooks Store, ready for you to download with just a few clicks. Reading books is intuitive and easy - turn pages with a swipe and zoom in on images with a pinch. If you're a student hitting the books, keep as many open as you like and search through them with ease. And when you take notes, highlight passages or add a bookmark on your Mac, iCloud pushes them to all your devices automatically. iCloud even remembers which page you're on. So if you start reading on your iPad, iPhone, or iPod touch, you can pick up right where you left off on your Mac. You can look up directions on your Mac and send them right to your iPhone for voice navigation on the way. In addition, your bookmarks and recent searches are automatically pushed to all your iOS devices, so you can plan trips on your Mac and have all the locations easily at hand when you're on the road. Of course, you can get information on local points of interest like restaurants and hotels, with phone numbers, photos, and even Yelp reviews. Because it's a native app, you can use every pixel of your display to explore new destinations. Maps also takes full advantage of the graphics power of your Mac. So zooming is smooth and responsive and you get gorgeous views such as Flyover, a photo-realistic, interactive 3D experience that lets you soar high above select cities. Remembering your passwords can be a real pain, but now iCloud Keychain remembers them for you. It stores your website user names and passwords on the Mac and iOS devices you've approved, protects them with robust 256-bit AES encryption and keeps them up to date on each device. And it automatically fills them in whenever you need them. It also works with credit card information, so checking out is quick yet secure. OS X takes full advantage of every display connected to your Mac, giving you even more flexibility to work the way you want. There's no longer a primary or secondary display - now each has its own menu bar, and the Dock is available on whichever screen you're working on. You can run a full-screen app on one display and have multiple windows on another display, or run a full‑screen app independently on each display. You can even turn your HDTV into a fully functional second display using AirPlay and Apple TV. Finder Tabs help you declutter your desktop by consolidating multiple Finder windows into one. For example, you could keep a tab for All My Files, one for Homework, and one for AirDrop, all in a single Finder window. Each tab can have its own view - icon, list, column, or Cover Flow. To move a file from tab to tab, just drag and drop. And you can even expand a Finder window to full screen and move files wherever you want with ease. Tags are an intuitive way to organize and find your files, even documents stored in iCloud. Simply tag the files you want to organize together with a keyword, like "Important." Then when you want to find those files, just click Important in the Finder sidebar or enter it in the search field. And all the files with that tag will appear together in one Finder window, even if they're stored in different locations. Tag a file once, or give it multiple tags to assign it to multiple projects. So if you're planning an event, you could tag the guest list you saved in Numbers, the flyer you designed in Pages, and the presentation you created in Keynote - and see them all with just one click. Just like shopping the App Store on an iPad, the Mac App Store offers endless possibilities to browse and purchase apps. New apps install in one step right to Launchpad. And the Mac App Store lets you know when app updates are available, so you always have the latest version. Designed with the Mac in mind, Safari emphasizes browsing, not the browser. In full-screen view, the browser frame is only a pixel wide, and you can hide almost the entire interface if you choose. So there's nothing to distract you from an article, video, or photo album. Navigating web pages is easy with trackpad gestures; flip through web pages with a swipe, and double tap or pinch the trackpad to zoom in on text or images. Safari also features Reader, which lets you peruse articles sans annoying ads. Don't have time to finish what you've started? Reading List lets you save links to articles and other web pages for later, and iCloud keeps your Reading List up to date across all your devices. Since pages render fast in Safari, you won't miss a minute of the web. Mail makes it easy to manage all your email from a single, ad-free inbox. It features powerful search capabilities, with search suggestions and tokens built in. It works with the free me.com email account you get when you sign up for iCloud, as well as most email standards - including POP3 and IMAP - and popular email services such as Gmail, Comcast, Time Warner, Charter, Cox, Yahoo! Mail, and AOL Mail. Mail supports Microsoft Exchange 2010, too. If you have more than one email account, no problem. Add your accounts to Mail and you'll be able to access all your email from one place. And Mail looks as great as it works. It makes full use of your display with a gorgeous widescreen view featuring a full-height message and a message list that includes snippets. With Conversations, messages from the same thread appear in an elegant timeline showing each communication as it was sent while hiding redundant text. Keep track of your busy schedule and share it with others using Calendar. Create separate calendars - one for home, another for school, a third for work, and so on. See all your calendars in a single window or choose to see only the calendars you want. Calendar lets you create invitations using information from Contacts, update your guest list, keep track of responses, and receive the latest status information. When you or another Mac user receives a Calendar invitation via Mail, it's automatically added. Calendar also works with iCloud, Yahoo!, and Google. And when you use iCloud, every Calendar edit you make on your Mac automatically appears on your iPad, iPhone, and iPod touch. So no dinner dates are missed, no meeting goes unattended, and no anniversary is forgotten. Contacts is a flexible and convenient place to store information for everyone you know. It's easy to import names, numbers, addresses, and photos from other applications. And it's designed for Facebook, too. Contacts automatically includes your friends' profile photos and information. And when friends update their information, Contacts updates your Mac. You can create smart groups for clubs, activities, and business purposes; print address labels and envelopes; and more. iCloud updates your contacts on your iPad, iPhone, iPod touch, and Mac - so when you enter someone's contact info once, you have it everywhere. And since Contacts is built on vCard, an industry standard for storing contact information, your friends can send you cards that you can add simply by dropping them into your contacts list - no typing required. Time Machine works with your Mac and an external hard drive (sold separately) or Time Capsule. Connect the drive, assign it to Time Machine, and start enjoying some peace of mind. Time Machine automatically backs up your entire Mac, including system files, applications, accounts, preferences, music, photos, movies, and documents. But what makes Time Machine different from other backup applications is that it not only keeps a spare copy of every file, it remembers how your system looked on any given day - so you can revisit your Mac as it appeared in the past. FaceTime for Mac makes it possible to talk, smile, and laugh with anyone on an iPad, iPhone 4S, iPhone 4, iPod touch, or another Mac from your Mac. And when someone tries to reach you, the call rings through on every Mac you own, even if FaceTime isn't running. So you never have to worry about making yourself available. If you don't want to receive calls, just turn FaceTime off in preferences. FaceTime is integrated with your Address Book so you can initiate chats easily. Take photo snapshots and video clips with your Mac using Photo Booth. Send them to your friends, use one as an iChat icon, add them to your Address Book, or organize and edit them in iPhoto. The real fun starts when you use the effects and backdrops in Photo Booth. Choose from nine effects that use facial tracking technology so effects look great whether you're front and center - or left of center. Snap single photos or shoot multiples in a four-photo burst. You can even shoot video clips, complete with effects, then trim them right in Photo Booth and send them to friends and family. And since Photo Booth can be viewed full screen, you'll enjoy every detail down to the last pixel. Box Dimensions (LxWxH) 16.4 x 12.5 x 4.1"
13.3" MacBook Pro Notebook Computer with Retina Display (Mid 2014) is rated 4.7 out of 5 by 12. Rated 5 out of 5 by Alex N. from Best Choice for College Students I, as a college student need everything from word processors to video editing and what not. We need things that are little to no cost because as students we need to save money. Purchasing my very first Mac Book Pro is a great deal because you have EVERYTHING in the computer. You get a Word Processor, Video Editor, Sticky Note, Spread Sheet, you name it its all free and best of all no worries of having to deal with viruses. I also have an ipad and I find it easy on transferring files to and from the devices. Over all a Great Product for College Students, It will last you lengthier laptop life compared to other computers. Rated 5 out of 5 by trianglekayak from Always Outstanding Apple Upgrading to this 2014 MacBook Pro from a 2009 MacBook Pro: both running Mavericks. The weight is lower, battery life is excellent and the SSD makes a big difference in access times. The boot time is excellent compared to a spinning HD. Upgrades to new iWork apps that come with new Mac purchases are a great bonus. I'm having to rethink some connectors (no ethernet witout an additional dongle) and no optical drive, but I think the tradeoffs will be worth it. Having HDMI will be a big plus. Looking forward to integrations between iOS8 and Yosemite. Speedy boot times and processing with Adobe Lightroom and iMovie. Looking forward to using USB3 peripherals. Rated 5 out of 5 by Dahni from Best MacBook ever! I love this laptop so much. It's faster then ever, the display quality is phenomenal, batter life is beyond this world and it's so much lighter than the older MacBooks! If you are weirded out by the fact that it doesn't have a CD drive, ask yourself when was the last time you used it! For me it was over a year ago! I def recommend for you to get this laptop. It's cutting edge and macs are the only computers that retain their value over time! Rated 1 out of 5 by Ben from 3 Replacements and still defects I'm assuming this is an issue with the lot of 2014 macbook pros at B&H, as I have gone through 3 replacements and all of them have had defects. 1st machine : Bottom panel was loose and making a rusty screw sound whenever you picked it up or touched the bottom. 2nd machine : Black plastic covering hinge was loose, making cracking sound whenever you touched it. 3rd machine : Trackpad barely clicks on the left side, only the right side does a full click. The machine itself is wonderful if NOT defective. Rated 5 out of 5 by obad100 from Amazing machine A magnificent machine with the stunning retina display, fast delivery from B&H, no tax and excellent customer service. I would deinitely recommend B&H to my friends and family. Rated 5 out of 5 by AmitB from Really, one of the best laptop computers Apple's MacBook Pro is IMO the best laptop to own. The display is absolutely lovely, and the 13 model has battery life that lasts me through trans-oceanic flights. With the 2014 models onwards the weight has also dropped considerably, and the solid state drives make this a really responsive machine. 2014 model also supports USB 3.0, so I would not recommend buying older models. I've worked with computers since the mid-80s, as a professional and otherwise, and IMO the Mac (with its OS and hardware) is one of the least problematic, and most easy to use machines I have ever come across. My only piece of advice would be that you watch the 128GB SSD model (the smallest in the range). At 128GB it can turn out to be much smaller than you might have imagines. You could end up needing an external SSD HD soon. Also, strongly recommend that you buy this with the USB 3.0 compatible Seagate external SSD HD, so that you can start backup up everything using TimeMachine on your MBP. Rated 5 out of 5 by AI from Great Buy at a Great Price Product was delivered fast, on time, and as promised by the description. Have not had one problem yet and love it! Would look to buy future items from this retailer. Would it be possible to add additional memory and/or storage down the line? Memory yes. Extra storage NO. Starting 2014 the flash memory is incorporated/attached to the motherboard. It cannot be removed by the end user and changed out. what is the weight of this model ?